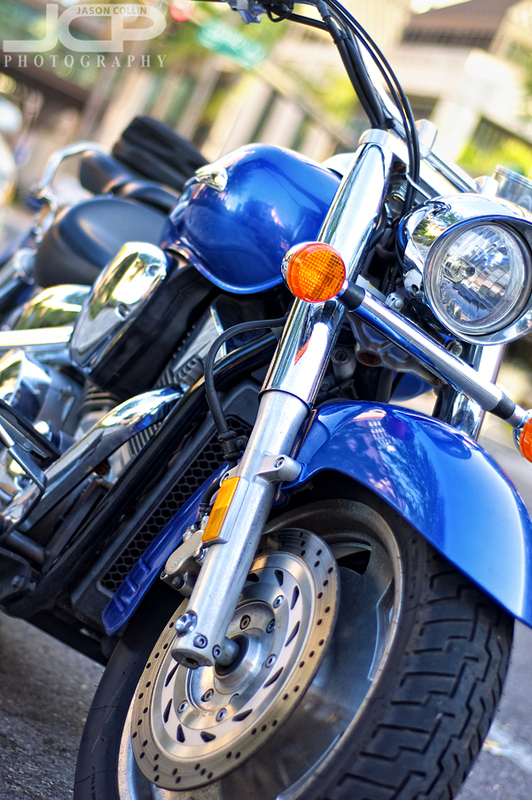 Get images like this of your motorcycle. Custom motorcycle shoots are available for the Tampa Bay area - reserve yours today! I have written before about how I like to photograph motorcycles just for fun. It often turns out when I come across a motorcycle that I have my Nikkor 50mm f/1.8D lens on my DSLR (or is it that having the 50mm lens on makes me look for motorcycles to shoot?). For a motorcycle parked on the street it would be pretty hard to fit the entire bike from wheel to wheel in the frame given the contraints of shooting at 50mm and of neighboring objects intruding into the edges of the frame and the background as well. So my photography tip, that does not just apply to motorcycles but any large or unwieldy subject, is do not photograph the entire subject. Rather fill the frame through the edges of the frame wiht the view of the subject that appeals to you the most. It helps to use a 50mm lens and its large aperture for this kind of shot because it is easy then to create bokeh even if the background is close to the subject. In this way you can still isolate your subject letting the viewer know absolutely what it is they are looking at. For this motorcycle shot I did not even worry about getting the entire front wheel in the frame, I definitely wanted the brake rotor in the shot and to compose at an off-level angle to help create a sense of motion with the motorcycle even though it is parked on the side of the road. Practice this kind of composition on a motorcycle the next time you see one or on another similar object and be sure and post a link to your results in the comments below.